Using recent cognitive scientific research and Aron Gurwitsch’s insights, I argue that the structure of attention is best thought of as tripartite. There are three distinct organizational principles coordinate with three dimensions of attention, and the focus of attention is only one of these three dimensions. Attention is a unified, dynamic embodied processing in the world, but can be seen phenomenologically and experimentally to operate in three distinct dimensions or domains. The theoretical context for attention experiments has always defined attention in terms of the focus or target. Gurwitsch’s writings also define attention as constrained to this one dimension, the theme. 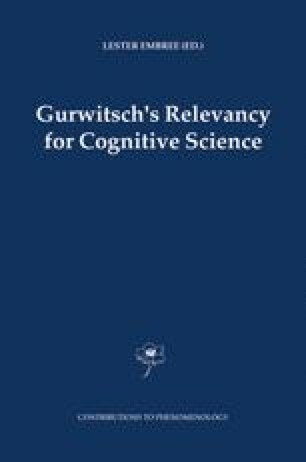 Yet allowing also for contextual attention and marginal attention squares well with recent experimental findings and with the implicit thrust of Gurwitsch’s phenomenology. With this expanded definition and function for attention, I interpret Gurwitsch’s thematic field and margin dimensions of consciousness as dimensions of attention.